Just click on the episode of your choice to listen free. Subscribe to have new episodes emailed to you directly. 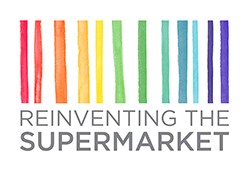 This is a complete directory of all episodes of The Reinventing the Supermarket Podcast Series with Melody Pattison Mehta. New episodes are also posted directly to iTunes. We are joined by Tom Szaky, founder and CEO of Terracycle as we discuss what’s known as “post consumer waste”. The supermarket is responsible for a vast amount of the trash and wastage in our world, and the focus of Tom Szaky and of Terracycle is to identify the treasure we’ve invested in that trash, and to recycle and upcycle as much as possible so as to relieve the pressure on our planet and its resources. It’s a vast task, so where do we even start? We are joined by nephrologist and obesity researcher Dr Jason Fung. Dr Fung is a researcher and clinician who is achieving superb results using fasting in the treatment of both obesity and diabetes. Dr Fung’s work brings together critical insights on insulin resistance, the nature of long term obesity, the weight set-point and how to alter it, and the incredible value of fasting as a treatment for obesity and diabetes.